Meet the Aussie upstart at the forefront of the most creative seafood cookery in the world. 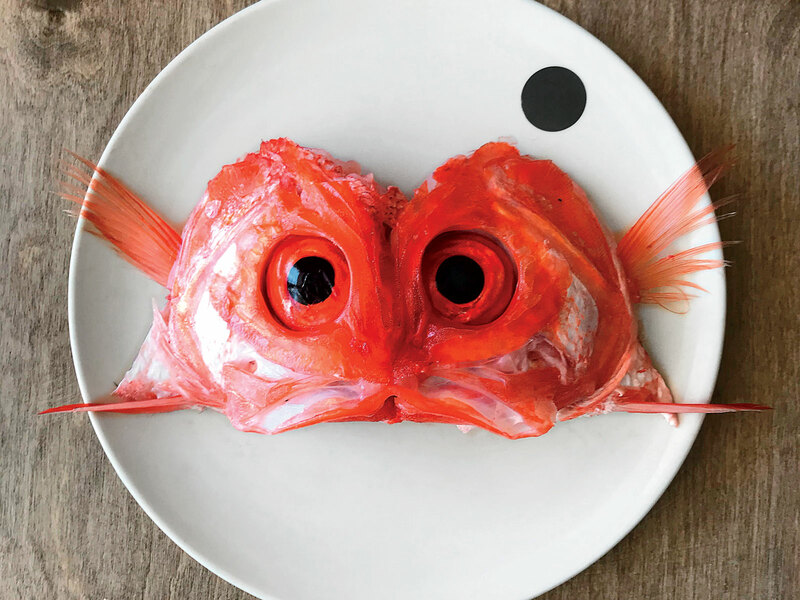 Chef Josh Niland can coax deliciousness from fish eyeballs. And swim bladders. (Fun fact: They crisp up like pork rinds.) And even from fish blood, which he transforms into a delicate black pudding, “that’s so delicious and has no aroma at all. People think it’s really over the top, but it’s more mellow than pig’s blood.” What’s more, he does it with elegance and a confidence instilled by the approval of a critical bellwether: his mother. Everything he puts on the plate at his 30-seat restaurant Saint Peter in Sydney, Australia, must first pass muster with his mother. “When I opened Saint Peter, I said we need a recipe for every single part of the fish, and we need to make it all delicious for my mother or any run-of-the-mill Australian family.”That’s how eyeballs made it on the menu. Plucked from the heads of mirror dory, they are ground into a paste, spread on large sheet pans, air dried, and baked until crunchy. They have a pleasantly savory flavor and texture akin to a fancy prawn cracker. For the 29 year-old chef, nothing is off-limits, and nothing goes to waste. Not even sperm sacs and stomachs (he cures then pan fries the former, known as milt, and uses the latter as casings for fish sausages), or the scales, which he once caramelized for a dessert at a charity event while cooking alongside Italian chef Massimo Bottura. Niland is not being deliberately cocky or confrontational, or even gimmicky. It’s a simple matter of mathematics. “If you’re going to commit to a $400 fish, and you think it’s okay to throw $235 of that fish in the bin [trash], then that’s not right.” That sentiment underscores an approach to sustainability and food waste that’s as much about building a better business model for a seafood restaurant as it is about pushing the boundaries of flavor. That intention was in part inspired during his formative years as a chef. When he started working in professional high-end kitchens in Sydney at the age of 17, many of them were championing the whole beast, and he found himself building his skills around that style of cooking. Those early years were followed by a four-month assignment in the UK as a stagier at Heston Blumenthal’s The Fat Duck where he predominately worked on the chef’s cookbook Heston at Home. While stationed near London, Niland and his wife Julie, a pastry chef, found themselves eating frequently at Fergus Henderson’s nose-to-tail temple, St John. Despite the extreme juxtaposition in style—Blumenthal’s Willy Wonka-esque molecular gastronomy, and Henderson’s offal-centric celebration of humble British bistro fare—what each one of them was doing in their respective restaurants utterly resonated with Niland. “I went overseas to try and find some clarity in terms of direction and style of food that I was hopefully going to aspire to personally.” And he had found it. When he returned home, he ended up working at one of Sydney’s most highly regarded seafood restaurants, Fish Face, under the mentorship of chef-owner Steve Hodges. It’s here he first started experimenting with fish offal, and where the seed was planted for a method of storing, preparing, and treating fish that’s quite unlike anything else in the world. But here’s Niland’s logic: A wet fish is a bad fish. Any moisture on a fish once it leaves the ice slurry that holds it right after it’s killed is slowly breaking down the flesh and shortening its shelf life. Water can work its way into the muscle or get trapped in the pockets where the scales used to be, speeding up degeneration. (This is why the common practice of washing fish under running water or displaying it on ice actually makes no sense, according to the chef.) By hanging fish in zero to minus two degrees Celsius static refrigeration, he can get up to 12 days more shelf life out of his most precious commodity—and with certain fish, like albacore tuna, three times that long. Most fish in restaurants have just a few days of storage in them before they spoil. It all goes back to the waste-not, want-not business model: “I think for a fish restaurant or a fish shop, the need for dry aging the way I do it, and the use of fish offal, is an absolute necessity.” Plus, he says the fish also develop a deeper and more significant flavor as the moisture and fat content transforms. Since Saint Peter opened in 2016, that approach has been so successful and the restaurant so busy, it has allowed Niland to open a second location a few doors up. 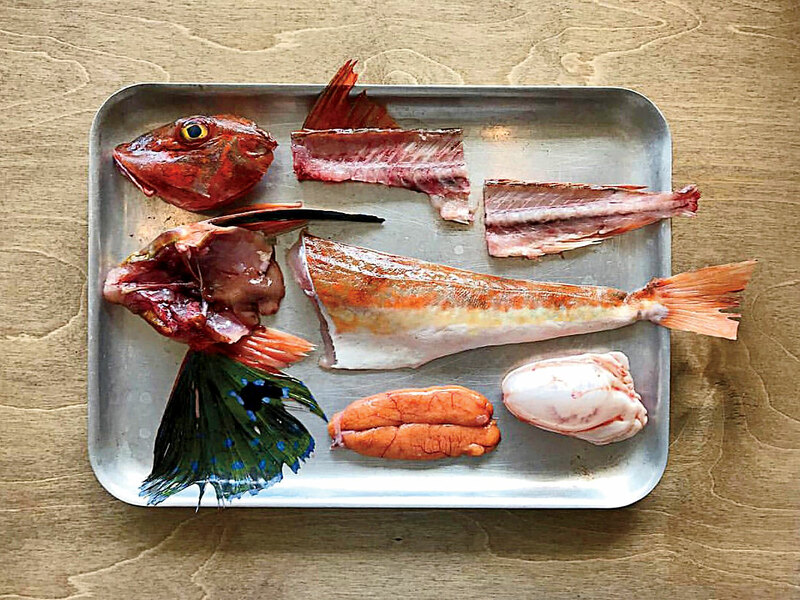 Fish Butchery is a retail space that carries up to 25 under-utilized Australian fish species, as well as an extension of the dry aging facility that supplies both the restaurant and the store. For those who can’t make it to Sydney to try Niland’s food, you can still get a unique insight into his world through his Instagram account @mrniland (68K followers and counting), where he captures his endeavors, sometimes hauntingly visceral, other times plainly cheeky, but always beautiful and restrained, just like his cooking.